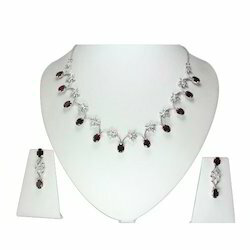 Offering you a complete choice of products which include ruby gemstone necklace, blue topaz gemstone 925 necklace set, tourmaline necklace set, emerald gold necklace set, amethyst single line necklace set in sterling silver and ruby and diamond necklace set in 14k yellow golg. 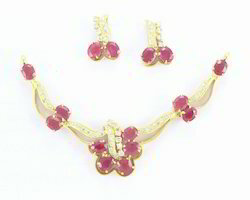 We offer a wide range of Ruby Gemstone Necklace. These are praised for their flowery designs and lustrous shine. Following the demands of clients, we offer these necklaces in multiple sizes and finish. 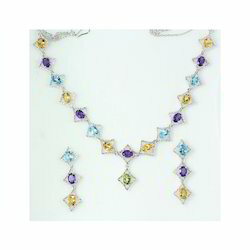 Our clients can avail these necklaces in various shapes and styles. These are manufactured under the firm direction of our experienced craftsmen using best available technologies. 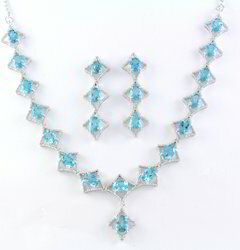 Our organization is counted among the prestigious supplier of attractive Blue Topaz Gemstone 925 Necklace Set. This is the best known for its beautiful finishing work, enthralling design and rust resistance. Worn with traditional and modern attires, these offered products are well crafted in tandem with the per-defined fashion trends. 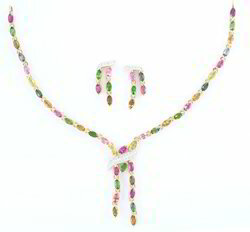 Offered to clients at the best price possible, the Tourmaline Necklace Set with gold are highly preferred in the market. Crafted by trusted vendors, the offered product is one of the finest that is available in the market. 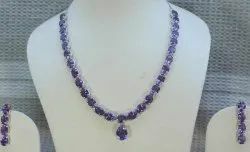 Our respected clients can avail this necklace in several designs and sizes so as to meet the exact needs of the clients within provided time-frame. 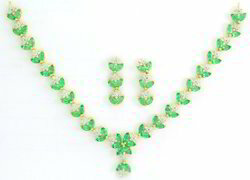 With the support of our creative designers, we are involved in offering a wide range of Emerald Gold Necklace Set with diamond. This light weight jewelry is designed using quality raw material to make them look ravishing and classy. Quality is best in the industry and we are constantly applying new and innovative thoughts to bring sound quality of necklace every day in the market.